Size Burmese pythons can easily reach 17 to 18 feet in length and reach weights of 200 pounds or more. It is possible for these snakes to reach 10 feet in length in their first 18 months. The largest recorded length was 26 feet. Life span Burmese pythons routinely live 25 years or more in captivity. Special Note Due to the large size and longevity of this species special care needs to be given to Burmese pythons and is not recommended for all hobbyists. Taking care of a snake this large is a long-term and often expensive commitment. This species has been known to cause death to people due to ignorance and improper handling. These snakes, like all snakes, should NOT be handled around your neck. General appearance Because of the abundance of specimens in captivity there are now many different color and pattern morphs available. 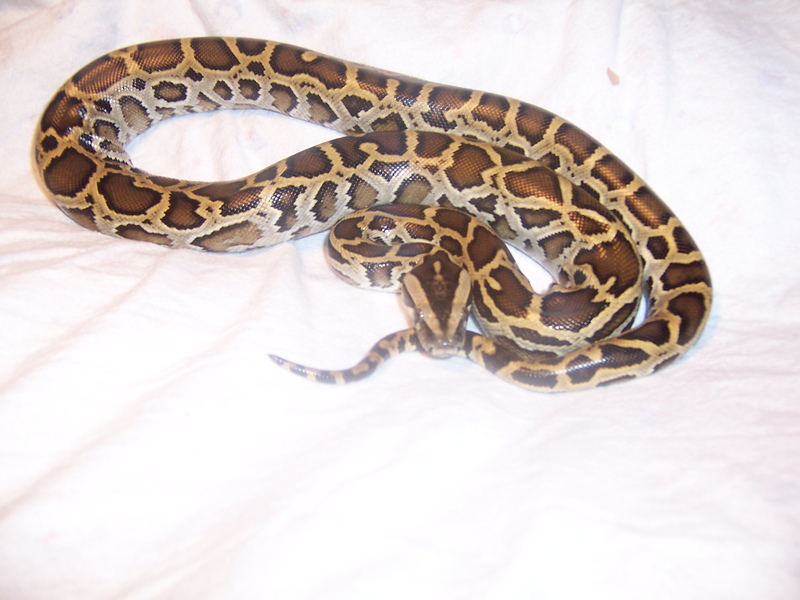 Some of the more popular morphs that are commonly found are the albino, green, labyrinth, granite, and tiger. Housing requirements Enclosure Young Burmese pythons can temporarily live in a 20-gallon or larger aquarium until larger housing is constructed. Due to the massive size of this snake custom housing is usually the only option. Enclosures should be at least six to eight feet in length by two to four feet in width by three to four feet tall though larger enclosures are always encouraged to give the snake more room. It is not recommended to use unfinished wood, as it is hard to disinfect. Temperature Daytime temperatures should be maintained at 85° to 90° F with a basking temperature of 90° to 93° F. Nighttime temperatures should be maintained at 75° to 80° F.
Heat/Light At this time UV light has not been proven to be required for snakes. A 10 to 12 hour photo period can be produced using a standard incandescent bulb. Using incandescent heat bulbs or ceramic emitters can produce basking spots. Using under the tank heating pads can raise ambient temperature of the enclosure if necessary. Hot rocks should never be used under any circumstance since they can result in burns to animal. It is recommended if lighting is inside the enclosure in enclose the fixture in wire mesh to protect the snake from accidental burns. Substrate Indoor/outdoor carpeting such as Astroturf™ can often provide an excellent substrate that is easy to clean and disinfect. Linoleum is also another excellent alternative. Other substrates such as newspaper, and aspen can also be used. Cedar is not to be used, as it is toxic. If the Burmese python is kept on wood shavings it is recommended to not feed it on that substrate as accidental ingestion of shavings can lead to intestinal blockages. Environment Burmese pythons come from the tropical rain forests and need a fair amount of humidity. Too much humidity can lead to bacterial infections while too low of humidity may cause problems when shedding. A water container large enough for the snake to soak in should be provided, but you may find it necessary to remove it at night in order to control humidity levels. Hide areas should also be provided. As the snake grows larger the keeper often has to become more creative. Cutting a hole on one side large enough for the snake to enter through can modify large plastic bins or garbage cans to become excellent hide boxes. Diet Hatchling Burmese pythons can eat a small adult mouse as their first meal. As the snake becomes larger, larger prey items should be offered. Adults will require adult rabbits. Young snakes can be fed one to two times per week. Adults should be fed less often in order to prevent obesity. It is recommended to use thawed previously killed frozen prey. The freezing process kills most parasites and eliminates the risk of injury to the snake by the prey. Wild prey is not recommended as it may contain unknown parasites or toxins that may illness in the snake. Maintenance The enclosure should be spot cleaned daily. If using indoor/outdoor carpeting it is recommended that you have at least a second piece available to swap with the soiled for ease of cleaning. A 5% bleach solution can be used to disinfect the enclosure as needed. Be sure to rinse and dry everything thoroughly before using. Water should be changed daily. It is recommended to wash your hands thoroughly after handling your animal or cleaning the cage or cage accessories.